Pennsylvania Gov. 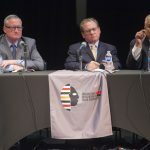 Tom Corbett came to Philadelphia for a conversation Tuesday. The state’s chief executive spoke on a number of issues. He touched on the current massive cuts in the state budget. He spoke about how to deal with the cuts to education funding and his no-new-taxes pledge. And he addressed the need to build business in order to create jobs. The governor said schools and universities, among others, are going to have to deal with cuts.